Ba'utha d'Ninwayeh or Rogation of the Ninevites is a three day fast commemorating the events of the Book of Jonah. The story tells of the prophet Jonah who was instructed by God to travel to the capital of Assyria, Nineveh, to preach to the inhabitants and tell them to repent. Instead of doing what God orders him to do, Jonah boards a ship heading to a different city in attempt to run away from God. God then sends a great wind and storm on the sea and Jonah is cast overboard. As Jonah is sinking into the sea, he is swallowed by a great fish and saved from the sea. Jonah spends three days and three nights in the belly of the fish praying and thanking God for saving him. God then orders the fish to spit out Jonah onto dry land and God tells Jonah to “go to the great city of Nineveh and proclaim to it the message I give you.” (Jonah 3:2). 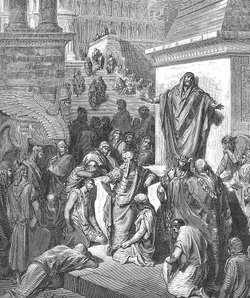 Jonah goes to Nineveh and preaches God's word to the people. When word reached the king of Nineveh, he sent a proclamation saying, "Let neither man nor beast, herd nor flock, taste any thing: let them not feed, nor drink water". (Jonah 3:7). The Ninevites repented and fasted and were redeemed. The fast was revived by the church in the sixth century. During this time, Assyrians were suffering from a plague so the bishops of Nineveh and Beth Garmeh (Karkha d'Beth Slokh or Kirkuk) decided to proclaim a fast in hopes that it would save them like it had saved their ancestors in the Book of Jonah. They shared their idea with the patriarch of the Church of the East. The patriarch approved and declared a three day fast and the people were saved from the plague. Assyrians continue to observe the fast to this day. There is a also a tradition within the Assyrian community that consists of making "pokhen", a salty mix of various ingredients. At the end of the fast, the "pokhen" is placed under the tongue before the person goes to sleep.